Just a few weeks ago we were stuck in a rut of sweltering 90-degree heat. This week, high temperatures have struggled to reach the 70’s, and lows on some days have dropped all the way down to the mid-40’s. These cool fronts have brought more rain into southern Minnesota, including 0.89 inches yesterday here in St. Peter. While the forecast for next week predicts mostly dry days, except for a slight warm-up this weekend high temperatures will remain in the mid- to high 60’s. If you’re someone who enjoys early morning walks, you might consider taking a stroll through the Linnaeus Arboretum on one of these cool September mornings. In addition to the many migrating songbirds flitting through the trees, you’re likely to find large congregations of monarch butterflies clustered on tree branches. As these butterflies migrate south, they often spend the night roosting together for both shelter and warmth. If you get to these areas before the sunlight hits the butterflies in the morning, you’ll be one of the few lucky ones that gets to see these monarch concentrations before they take wing. Sometimes your very presence will disturb the insects however, resulting in an abrupt flight of sometimes hundreds of these orange-and-black wonders into the airspace above your head. Several observers have noted large monarch congregations on early mornings this week in the Arb, especially along the wooded trails north of the Borgeson Cabin and on the north side of the Jones Northern Forest Ponds. Additionally, if you’re not one who enjoys the early morning hours, it is possible to see these congregations take shape later in the day during rain showers. 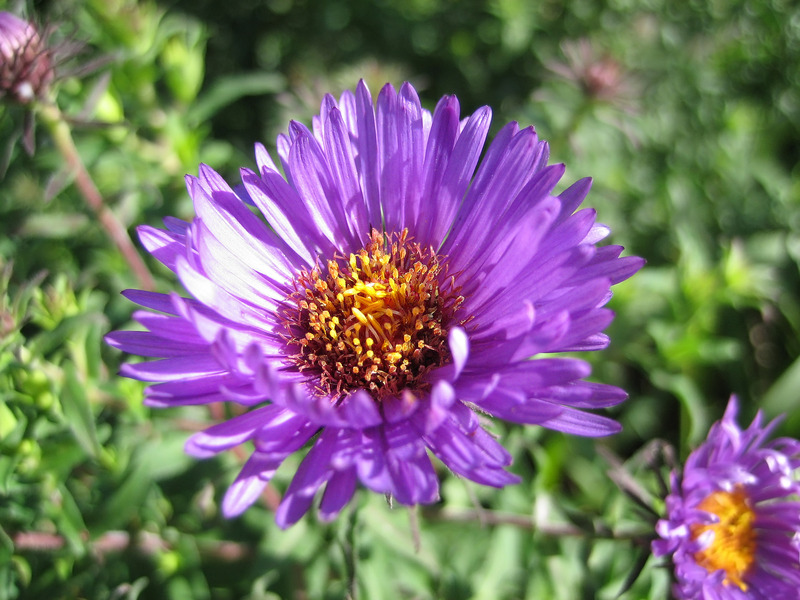 New England Aster blooming in Thornberg Garden on east side of Interpretive Center, 9/8/10.